This Brighton group is Johnny Dee and the Initials, photographed around 1963. The venue is The Florida Rooms which was a night club situated somewhere in the area of the Aquarium. 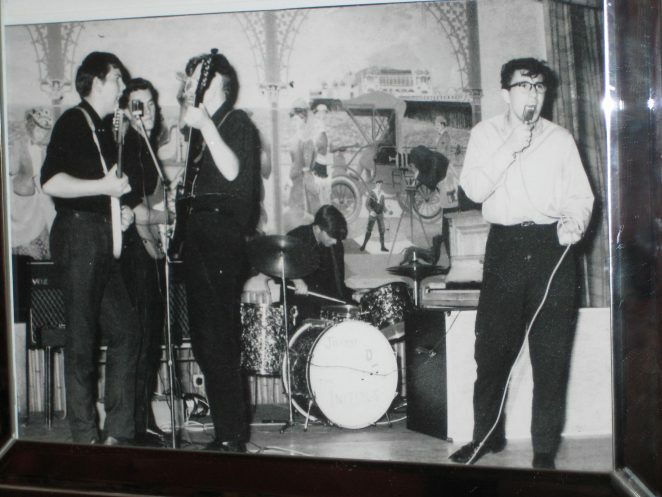 Group members are, left to right, Rick Gadd, Pete Fuller, Jez Loveland, Dave Charlewood on the drums, and John Grover. Jez Loveland, bass guitar, later left and joined a backing group for P J Proby I believe. Do you remember Johnny Dee and the Initials? Maybe you remember The Florida Rooms? If you can share your memories with us, please leave a comment below. Hello. Don’t remember the band – there were so many to choose from then, but do remember fine times spent at The Florida Rooms in my youth. Can some one tell me if Rick Gadd went to the Knoll School for Boys and later joined the Sid Dean Band at the Suite? Hello David, you are correct that Rick Gaadd did go to the Knoll School but he did not go on to join the Sid Dean band, however he did go on to join the quartet that played at the Regent ballroom in Brighton. The name of the quartet escapes me. Yes I remember the Florida rooms very well. I worked on the door for Boni Manzi. I was there when it was Jazz, also The Who, and Bowie, Rod Stewart, Long John Baldry, Merseys, Manfred Man, Pretty Things, The Web, King Gerry, DJ, Jimmy Hendrix, Jeff Beck, Amen Corner, Arthur Brown and so many more to name. I still kept in touch with Roger Daltry, and the rest, till some passed away – Moonie, Entwhistle. Great days, had great times with Ronnie Wood the Moody Blues. I was 17/18 in 1962-63 and I went with friends on a Tuesday night to the Florida rooms (Thursday to the Regent). They were at the bottom of the Aquarium steps opposite the Palace Pier, your hand was stamped for entry and re-entry. I don’t remember the band. The tunnel at the bottom of the steps to the beach was open then and seemed to attract its fair share of courting couples. I met my first husband at the Zodiac coffe bar over Hiltons in St James St. We were so lucky to be teenagers then. I was the bass player in that band before it was called the Initials, it was then Johnny Dee and the Trekkers. The line up was Rick Gadd on lead guitar, John Grover – vocals, Pete Grover – rhythm guitar and yours truly on bass and I think it was my old friend John Hills who was the drummer. I remember once playing at a regular gig near the Grenadier pub in Hove when I was told we had a new singer – it was in fact John Grover with dyed blond hair. Most of the stuff we played were Cliff Richard numbers and other 50s and early 60s rock ‘n roll. We all started together in the very early 60s as an instrumental band playing Shadows’ and Ventures’ instrumentals. The line up then was Rick Gadd lead, Pete Fuller rhythm, John Hills drums and me on bass. I produced a design for a poster for the Florida Rooms in the early 60s when the headliner was The Mark Leeman 5 with the Who as a support act. I remember the poster was not required as sadly Mark Leeman was tragically killed in a road traffic accident and, as I remember, the Who took over their lead spot. I think I still have the rough design for the poster. Good days as I recall. I also remember drinking Red Barrel in dimpled glasses in the little bar that was to the side of the stage with Roger Daltrey leaning against the bar next to me. My name is John Grover (aka Johnny Dee) I remember very well Chris Kisko as some years before we were friends. Chris as I remember was from Canada and lived off the sea front. Good to hear from you again if you would like to e-mail me my address is jm.grover@hotmail.co.uk our last meeting must have been 50 years ago or even more. With regard to James Gaitley I am sorry but I have no recolection of your good self. I never played with a group called the Trekkers however I did play with a group called the Themes but I was not called Johnny Dee at that Time. You are quite correct about the blond hair. The bass player all the time I sang with the Initials was Jez Loveland and when he left to join a group backing P J Proby the group the Initials broke up. This is for Chris Kisko. I now live in a small West Sussex village called Lindfield (very chocolate box). I have lived here for 12 years. I however never made a career out of music but have had a very happy life with my wife Yvonne for 46 years and have 2 sons: Russell is my eldest son and is 44 years old, my other son is Christopher who is 42 years old. I have 2 grandchildren both boys: Archie is the eldest, he is 13 years old, and his brother is Spencer and he is 10 years old. I am not in the best of health but it is not terminal. Well not much else to add but hope to hear from you soon. Best Regards. How great to read about people and places I remember so well and that were such a big part of my life. The Florida Rooms, the wonderful nights I spent down there, looking up at the stage lovingly watching my boyfriend Jez playing the bass and proudly watching Rick Gadd, Pete Fuller, Dave Charlewood, and John Grover. The Initials, were a great band, I was so proud of them, and so in love, but then again at 15 or 16 the boy in your life really is your whole world at the time. Jez and I had to part because he had a promising career in America. I did see him a couple of times when he returned to England, in fact I have seen him a couple of times over the last few years also met his lovely wife. I live in Western Australia now, but return home for holidays a couple of times a year. Whenever I see bands from the past regroup and do “one last tour” I always wish The Initials could do the same, I’d travel around the world to see them. Thanks for the memories. This is for John Grover: I tried to email you via the address you gave in your comment above but no reply. I have tried to trace your phone number but no luck so you can contact me at my email if you want: chriskisko@rocketmail.com. Thanks for that, and hope you read this. I took many of the photos of the Initials - originally with Gene Bennett and later with Johnny Dee. They were both great bands. There is a good book which contains a lot of info and photos of the Brighton music scene written by Mike Read, called the South Coast Beat Scene of the 1960s hopefully it’s still available. James Gaitley, you are right about Rick and Peter being in the Trekkers. Rick was about 14 and showing many older guitarists how to play. I remember once a chap staring at Rick until the interval when he went over and said “I have been playing the guitar for years but now I am going to give up!”. Rick and Peter then joined Mick Law (aka Gene Bennett) and formed the Initials with Jez. There may have been another short-lived group in between, but not sure. My memory of the Trekkers is that they usually needed a taxi to take them to the gigs as they usually had no transport. Hello Rodger and thanks for confirming my post. Our first instrumental band started from the Knoll school for boys with Rick Gadd, PeteFuller, John Hills, and me Jim Gaitley. We played at pubs such as the Battle of Trafalgar in Portslade, and the at the Maytree pub opposite the Knoll school. We went on to play in the Mexican Hat in Worthing and the Little Hat in Littlehampton. You are quite right that in those early days we used the Taxi service just above Portslade station as our transport service. After some time John Hills and Pete Fuller left, and myself and Rick Gadd were taken aback when we saw Pete Fuller with a Fender Stratocaster appearing with Gene Bennet at the Florida rooms. Rick and I then joined up with John Grover and his brother Pete playing mostly Cliff and the Shadows stuff at a regular gig in Hangleton and a gig at Tarring when we had to constantly repeat the latest Cliff number ‘Batchelor Boy’. I did email John Grover about his memory lapse and how we used to practice our repetoire in his first floor living room and his brother Pete used a converted TV cabinet as his amplifier, but alas, no response. Just found this page, I am Pete Grover’s daughter and remember him telling me stories of the bands he was in. Would love to see some old photos of my dad in the band. Kathryn, I have a number of photos of the Initials which I will try to post for you. I worked at the jazz club and also the Florida Rooms with visits from all the bands: The Who, Moody Blues, Animals, Jeff Beck, Mersey Beats, The Birds, Lionel Richie and the Commodores, Gary Farr, T Bones, Manfred Mann, Paul Jones, Roy Wood, The Move, Arthur Brown, Jonny Dell, The Cressants, Rod and the Steam Packet, Amen Corner, Swinging Blue Jean, Stevie Ferrone, Jimmy Hendrix – and many more! Went to The Florida rooms after working at Joe Lyon’s corner shop at the bottom of St James’s Street. Remember well seeing Gary Farr and the T Bones, and Count Downe and the Zeros. Does anyone have any memories of a mod band called The Motion – seem to remember them doing all the local clubs? Hi, my husband Alex Macpherson was in the mod band The Motion. Does anybody remember a group called Beat Syndicate, they use to rehearse at Carden school on a Monday evening? When I had finished at girl guides we would go round to the classroom window and listen to them. They also played at the school discos. The Motion … remember them well. Followed them around 67 centre and Carden School. Plenty of Motown covers, if I remember. Hi Jenny Jeal. Just to let you know I was the bass guitarist of The Beat Syndicate and remember well the rehearsals at Carden School. I still play in a duo with Mick, lead guitarist, and Roger, drummer, and Ricky, guitarist – they both live in Yorkshire. I too remember seeing “The Motion” at the Portslade Courthope Youth Club. I have a photo of them if I knew how to post it?